Area Colleges First Day Of Class This Week, Local School Systems Start Next Week. Summertime is almost officially over for students in the local college and school systems. With move-in taking place this past weekend for ASU and Lees-McRae students, their attention now turns to the first day of class. Lees-McRae and the Watauga Campus of Caldwell Community College begin on Monday (Aug 15), while ASU starts on Tuesday (Aug 16). Watauga County Schools first day for students is Monday August 22, as is the case with Ashe and Avery. North Carolina schools are required to be in session at least 185 days OR for 1,025 hours of instruction. Schools are required to start no earlier than the Monday closest to August 26. This year that Monday falls on August 29. WCS has a one week waiver due to the history of days missed due to weather, hence the August 22 start date. 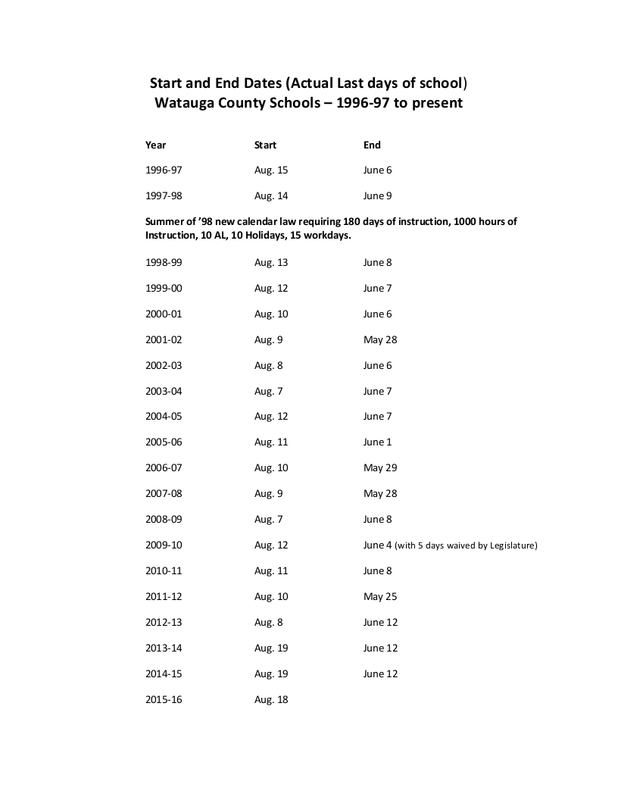 As you can see in the history of start and stop dates below, this will be the latest WCS has started school. Dr. Scott Elliott, Superintendent of Watauga County Schools, tells WataugaOnline.com excitment is here to start another school year. “We are expecting our largest enrollment in several years and look forward to seeing all our students and teachers back in school” he adds. Around 33 new teachers and 13 support staff members are new additions to the school system for the 2016-17 season. One of those new teachers is Keana Triplett, the North Carolina Teacher of the Year for 2015-16. Triplett joins Watauga after having taught in Ashe County. Dr. Elliott is also encouraging everyone to check out the new website for the school system. It can be found at www.watauga.k12.nc.us. You can also follow on Twitter to keep up with items happening in the school district.